The next upcoming Flag Day is on Friday June 14th, 2019. Flag Day is observed on June 14 to honor and commemorate the adoption of the American flag which occurred on this day in 1777 by the Second Continental Congress. The United States Army also celebrates its birthday on this day. One year earlier the United States declared Independence from Great Britain with the signing of the Declaration of Independence on July 4, 1776. Flag Day highlights the symbolism of the country's foundational ideals and nation's freedom. It honors the United States flag as that symbol and an opportunity for the country to reaffirm their belief in liberty and justice. 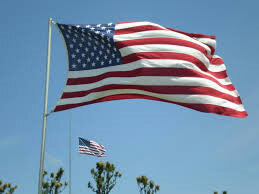 People honor this day displaying the American flag outside their homes and in public. Other ways to celebrate are parades, flag raising ceremonies, music, and services. The American flag was adopted in 1777 after the Coninental Congress decided to replace the British Grand Union flag with a new design of 13 white stars in a circle and 13 red and white stripes, representing all 13 states. The first annual observance was in June of 1886 by Bernard Cigrand. His effort brought the proclamation made by President Woodrow Wilson as a national observance on June 14, 1916.